In her international bestseller Strong Is the New Pretty (with 329,000 copies in print), the photographer Kate T. Parker changed the way we see girls by showing us their truest selves - fearless, messy, wild, stubborn, proud. Now it’s time to talk about our boys. Prompted by #metoo, school shootings, bullying, and other toxic behaviour, there’s a national conversation going on about what defines masculinity and how to raise sons to become good people. And Kate Parker is joining in by turning her lens to boys. The result is possibly even more moving, more eloquent, more surprising than Strong. 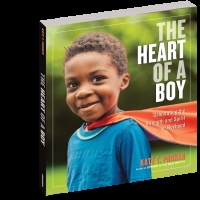 The Heart of a Boy is a deeply felt celebration of boyhood as it’s etched in the faces and bodies of dozens of boys, ages 5 to 18. There’s the pensive look of a skateboarder caught in a moment between rides. The years of dedication in a ballet dancer’s poise. The love of a younger brother hugging his older brother. The unself-conscious joy of a goofy grin with a missing tooth. The casual intimacy of two friends at a lemonade stand. The shyness of a lone boy and his model boat. The intensity in a football huddle. The proud, challenging gaze of a boy bald from alopecia - and the same kind of gaze, but wreathed in tenderness, of a boy a few years younger with flowing, almost waist-length hair. There are guitarists, fencers, wrestlers, star-gazers, a pilot - it’s the world of our sons, in all their amazing variety and difference. The photographs feel spontaneous, direct, and with so much eye contact between the viewed and the viewer that it’s impossible to turn away. And throughout, words from the boys themselves enrich every photo. What a gift for boys and anyone who is raising them. From Kate T. Parker, bestselling author and photographer of Strong Is the New Pretty, a photographic celebration of what makes a boy, with portraits and quotations from today's boys, ages 5- 18.